CBR Summer Students Visit Canadian Blood Services! What is involved in getting blood that has been donated at a mobile clinic in Campbell River to a patient on the operating table at Vancouver General Hospital? On Tuesday, July 24th, the CBR Summer Students headed to Canadian Blood Services’ Vancouver location to find out. The clinic and labs are located at Oak Street and 32nd Avenue, right next to BC Children’s Hospital. Our tour was led by Dr. Tanya Petraszko, a hematologist and medical director at Canadian Blood Services. Created in 1998, Canadian Blood Services (CBS) is a not-for-profit charitable organization that manages the Canadian blood supply. With 36 fixed collection sites and more than 14,000 donor clinics every year, they are responsible for recruiting and collecting blood, plasma, and platelets all the way from Halifax to BC. The only exception is in Québec, where Héma-Québec operates. Dr. Petraszko pointed out that this national scope is one of the things that makes CBS so special. 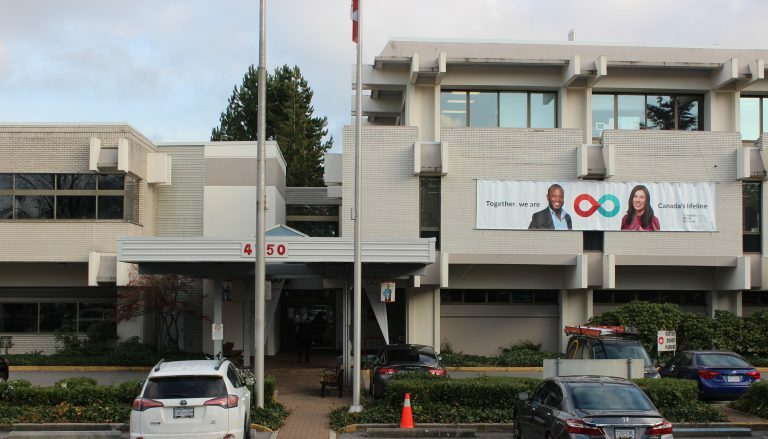 Canadian Blood Services in Vancouver. Photo credit: Canadian Blood Services. The Vancouver location that we toured also houses the production laboratory where blood from all over BC comes for processing. The protocols for transport change based on a number of factors, including the weather. Red blood cells aren’t fans of the July heat! When we arrived in the lab it was fairly quiet. Dr. Petraszko explained that often the busiest time is at night as units that have been donated throughout the day arrive. Samples of these units will have been sent for testing for things like infectious diseases and blood groups. Once the units arrive, blood products such as RBCs, plasma, and platelets, are separated and stored in appropriate conditions, just like at netCAD. We watched as labels were placed on products to reconcile them with their test results. Once testing and production are complete, the products are released to inventory and are ready to be distributed as needed to hospitals. Many of us were not aware of the other services that CBS provides to Canadians. Dr. Petraszko explained that half of the CBS’ budget goes towards purchasing plasma protein products from the US for distribution within Canada. CBS also operates a Cord Blood Bank, the OneMatch Stem Cell and Marrow Network. Dr. Petraszko highlighted the fact that in the past, there was not fair distribution of organs across the country. CBS now manages the national patient registries for organ donation and transplantation in an equitable manner. We were interested to learn about the Kidney Paired Donation Program that allows people who aren’t a match for a loved one to still help through the swapping of compatible kidneys through multiple donor-recipient pairs to start ‘domino’ chains of transplants. The CBS recently facilitated their 1000th kidney transplant! The CBR Summer Students would like to extend a big thank-you to Dr. Petraszko, others at the CBS Vancouver location, and Julie Kora for the opportunity to tour the facility. We now have a much better understanding of the work being done by Canadian Blood Services, and a new appreciation for its breadth. To find out more about Canadian Blood Services and becoming a donor, please check out https://blood.ca/, or ask a Summer Student!